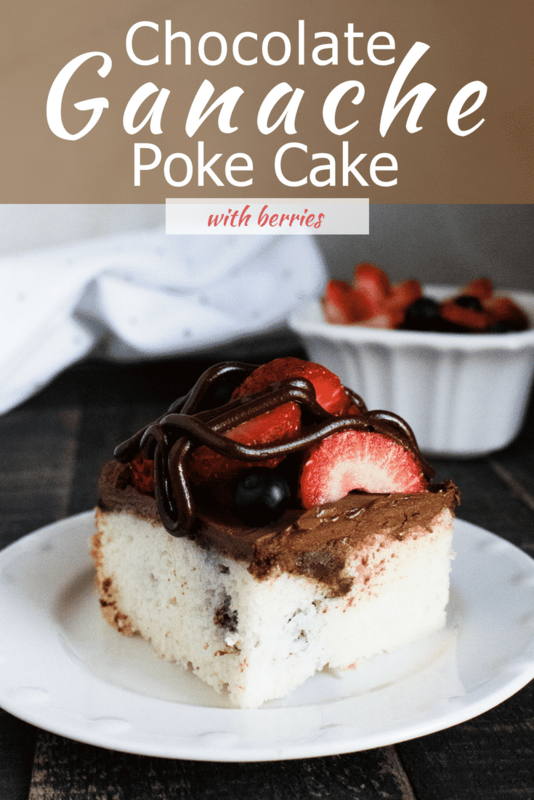 Chocolate Ganache Poke Cake with Berries is the perfect dessert for family gatherings, special events, potlucks, and any time you want a sweet treat that’s sure to be a hit. In this recipe, light and airy white cake perfectly balances the rich, decadent chocolate ganache. And, when you top it off with a medley of fresh berries, you’ve got a truly tasty and festive crowd-pleaser that is sure to delight. Poke cake was invented by the Jell-O Company in 1969, as a way to increase their product sales. 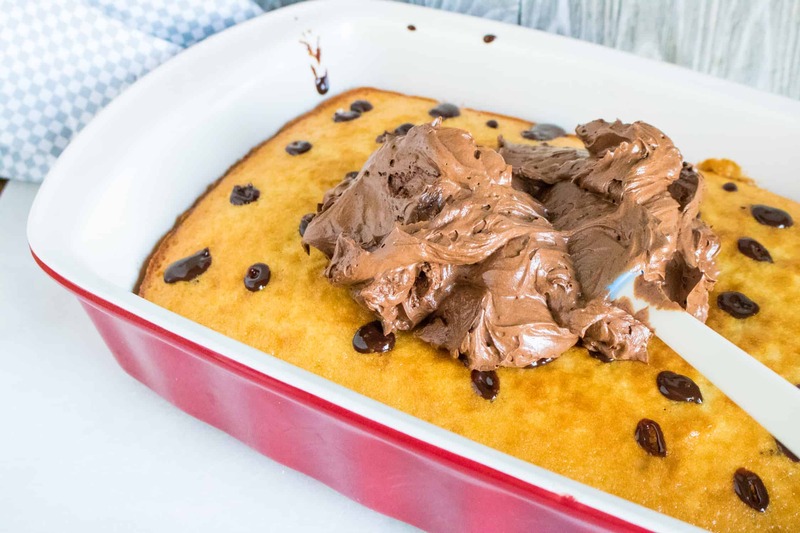 The original version is made by baking a white sheet cake, and when cooled, poking holes into the top of the cake using a fork. Next, strawberry Jell-O mix is poured all over the top of the cake, allowing it to fill the holes. Then the cake is put into the fridge to allow the Jell-O to fully set. The chilled cake is then frosted with whipped topping. Poke cakes are currently enjoying renewed popularity, and bakers are going beyond the traditional gelatin to fill their poke cakes with everything from salted caramel, flavored syrups and boozy cocktail mixtures, to coffee and chocolate ganache. Tip #1: Change up the size of the holes you’re going to poke to accommodate the type of filling you are using. 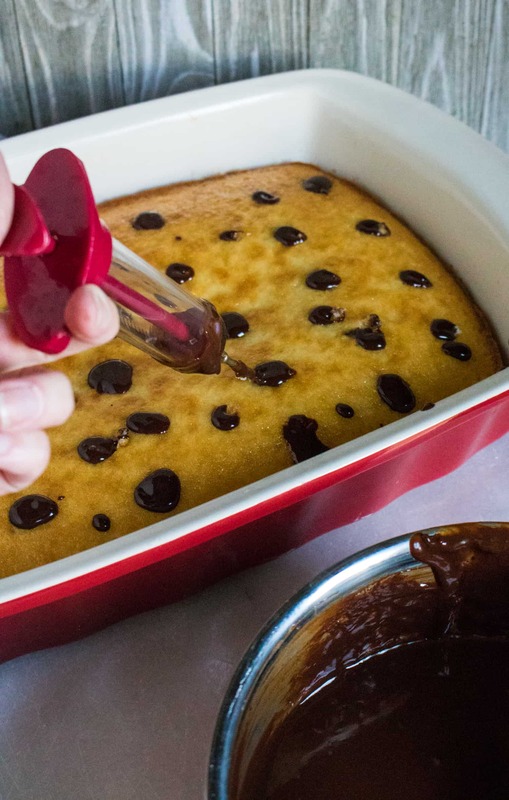 For flavored syrups of gelatins, perforate the entire top of the cake with a fork. And for thicker sauces or creams, poke evenly-spaced, larger-sized holes by using a wooden skewer or the tip of a wooden spoon handle. Tip #2: When making this Chocolate Ganache Poke Cake recipe, use a pastry filling injector to ensure that a perfect portion of that delectable chocolate ganache is included in every single bite. 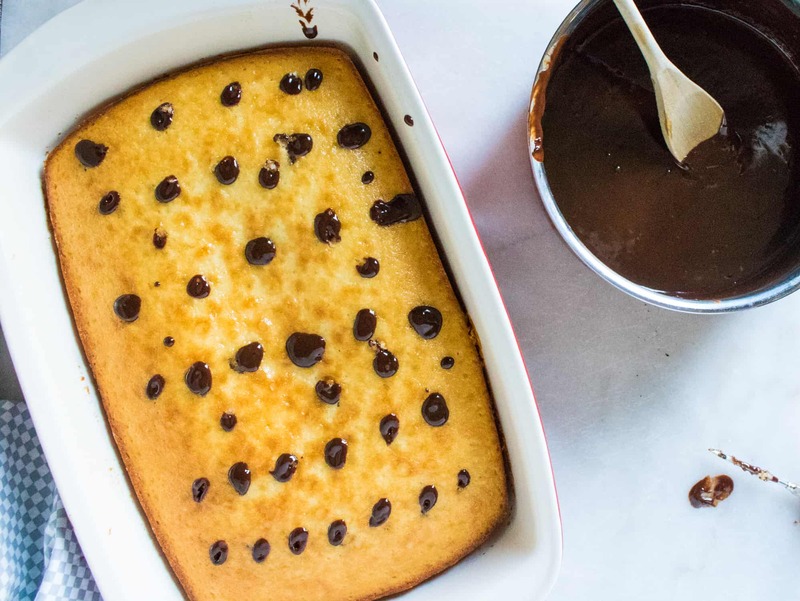 Step #1: Bake cake in 13×9 pan according to package instructions, remove from oven, and allow to cool completely. Step #2: Melt chocolate chips with heavy whipping cream on stovetop over medium low heat. Then use a meat or pastry filling injector to insert 1/3 of the ganache into the cake by poking holes and then squeezing the chocolate into the cake. Or, you can poke the holes with a wooden skewer or spoon, then pour the chocolate ganache into the holes. But the injector will allow for a more even distribution. Step #3: Next, refrigerate remaining chocolate ganache for about 30 minutes to chill. Pour into a stand mixer bowl, and whip at high speed until thickened. The whipped chocolate ganache will be lighter in color. Step #4: Spread layer of whipped chocolate ganache over the cake, then refrigerate for 2-4 hours. Step #5: Before serving, add a layer of whipped topping, and 3 cups of fresh berries. 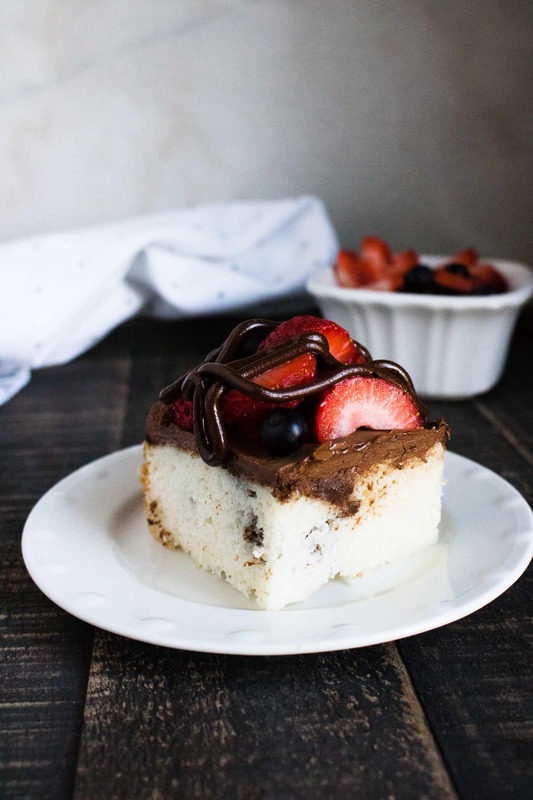 Light and airy white cake balanced with rich, decadent chocolate ganache and a medley of fresh berries makes this a crowd-pleasing delight. Melt chocolate chips with heavy whipping cream on stovetop over medium low heat. Use a meat injector to insert 1/3 of it into the cake by poking holes and squeezing chocolate into the cake. Alternatively, you can poke holes with a wooden skewer or spoon and pour the chocolate ganache into the holes. The injector allows for a more even distribution. Next, refrigerate remaining chocolate ganache for about 30 minutes to chill. Pour into a stand mixer bowl and whip at high speed until thickened. The whipped chocolate ganache will be lighter in color. 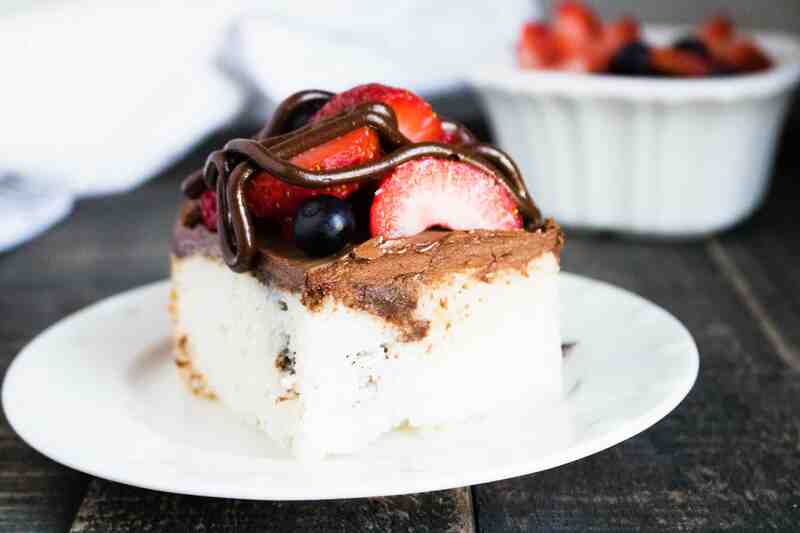 Spread layer of whipped chocolate ganache over the cake. Refrigerate for 2-4 hours. Before serving, add a layer of whipped topping and 3 cups of fresh berries.